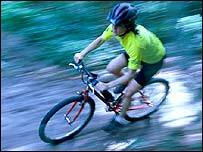 Campaigners fighting plans for six wind turbines near a mountain bike centre in south Wales are looking to visitors to back their fight to stop the scheme. Earlier this month Eco2 Ltd exhibited its plans for Corrwg Fechan Mountain to people in Glyncorrwg near Port Talbot. Some opposed to the scheme have set up an action group with one concern being the effect on tourism. Eco2, which is preparing a planning application, disputed its plans would have any effect on tourism. A public meeting was held in the village following Eco2's two day presentation. Anti-wind turbine campaigner Robert Slater said: "The area has gone through a very rough time and things were just turning around and then we had this. "A lot of time and money has been spent building up the mountain biker centre and we now get visitors from all over the country. It is an unspoilt wilderness." The Neath, Port Talbot and Pontardawe area is one of seven in Wales identified by the Welsh Assembly Government as being suitable for further wind farm development. 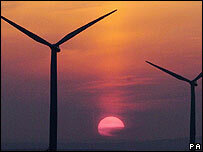 By 2010, Wales is committed to having 10% of its electricity supplied by renewable sources. "They are planning on dumping quite a number around here," added Mr Slater. "If the government want wind farms they have got to be spread across the country and not concentrated in one place." The action group has won the support of Aberavon MP Hywel Francis. "A great deal of long-term investment has gone into Glyncorrwg to regenerate the village and attract more tourists. "Developments such as the mountain bike centre will be under threat if the plan to build a wind farm got the go ahead." Eco2 said it had invited around 1,000 to its presentations and said there were people both for and against the proposal. It said it had undertaken an extensive environmental assessment over the past 12 months to minimise any environmental impacts. It said Mynydd Corrwg had suitable electricity grid connections, good roads and high wind speed. A community trust fund would be given a share of the profits, added the company. "There is no conclusive evidence to suggest that wind farms effect tourism or house prices," said a statement.